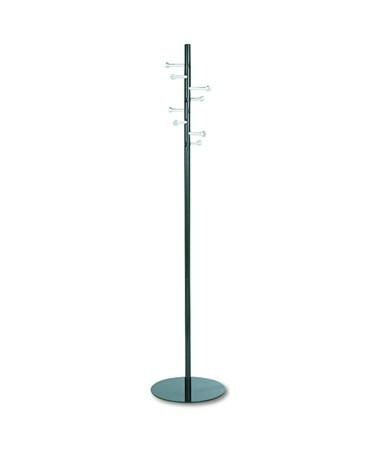 The Safco Spiral Nail Head Coat Rack is a simple-looking but tough rack for hanging coats, jackets, and other garments. It features eight nail head hooks that can hold up to 10 pounds each. It rounded tips are designed to help prevent garments from tearing. This 67 inches tall rack stands firmly on 15 inches diameter base. It is made of steel with a powder coat and brushed aluminum finish. This garment rack is also certified by GREENGUARD to have low to no chemical emissions and is safe for indoor use.